The new LINETRAXX® PEM353 addresses applications in low-voltage main distribution boards (LVMD), data centres and building installations. As a modern display instrument for electrical quantities, it is equally suitable for monitoring power quality and energy data. With its standardised enclosure (DIN 96 x 96 mm), it is intended for front panel installation. The compact size of just 7 mm facilitates almost seamless integration. 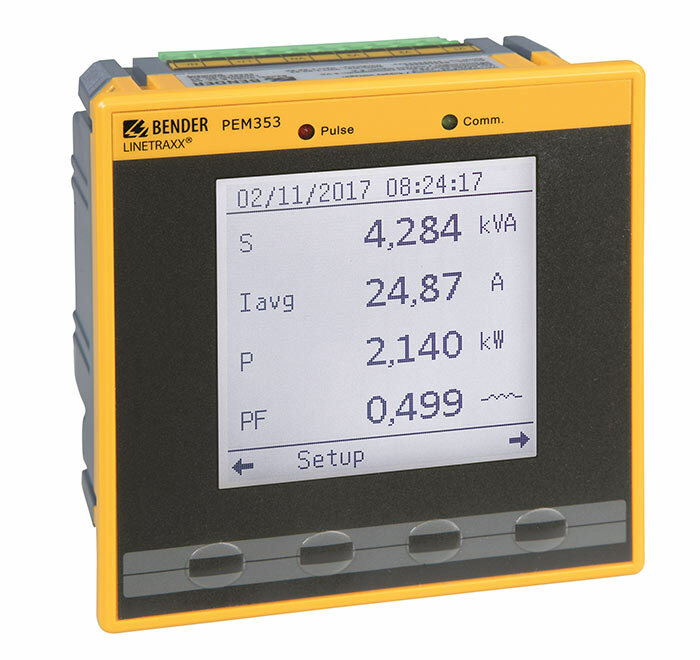 In the context of energy data monitoring, the PEM353 provides the measurement quantities for real energy, and does so with outstanding accuracy (class 0.5 S). Active, reactive and apparent energy levels are counted for each phase, and as a cumulative value. This allows recording up to three single-phase resources. Other types of energy, e.g. meters for compressed air, water and gas, are recorded via pulse counters. The package is completed with the recording of daily energy values for the preceding two months and monthly energy values for the preceding three years. Focus was also placed on easy operation. The backlit LC display is equipped with a clear text display: Measurement parameters are clearly legible. Quick and intuitive operation – i.e. without a long familiarisation period – is possible via the four buttons and the button function displayed directly above. The fourth current input can be used for N conductor measurement. This enables any possible overload of the N conductor to be detected at an early stage by 3n harmonics. This reduces the risk of fire, and the risk of overvoltage on single-phase consumers, which may result from a break in an N conductor. The comprehensive equipment features of the PEM353 make it suitable for power quality monitoring and energy data monitoring, and it also serves to improve reliable plant availability by monitoring the N conductor.